Over the past few years, I have been passionate in my quest to understand more about Earth Energies and the subtle energies that are everywhere around us. I have learned that we affect the energies as much as they affect us. My latest insight, what I call " the two lights of the soul," answers many questions about how many of these subtle energies actually get there in the first place and why it is that we can affect them so easily. I feel this to be my most significant discovery to date and it applies to everyone, not just to dowsers. As dowsers, however, we have the opportunity to explore a world that is invisible to most of us, and therefore can understand it better. In Of Spirals and Rings, I share my first discovery in the dowsing world, the fact that virtually all natural energy fields form spirals or, more accurately, vortexes. This ties in with the teachings of one of the most enlightened beings ever to walk the planet, Walter Russell. The energy fields emanating from people, plants, trees, and animals create vortexes that expand into infinity. Where two or more energy leys intersect to create a power spot and where two underground streams of water cross each other, vortexes are also created. In Nature Supports Us in Our Efforts, I tell how I discovered that beneficial and detrimental energies are everywhere around us in our living environments. We can find "mini" power spots in our homes, especially in our most frequently used areas, such as around stoves, desks, beds, and favorite chairs. I believe that Nature supports us and supports all of life with these energies. In A Dowsing: Path to Enlightenment, I reveal how we can transmute detrimental energies into beneficial energies, simply with the power of prayer. We can actually convert noxious rays into beneficial energy leys, because a noxious ray, in my opinion, is simply a negative energy ley. We can change the energies of detrimental underground streams of water to be beneficial to us. We can even make the detrimental energies emanating from computer screens, TV's, and microwave ovens to be beneficial to us. I don't consider this to be "mental clearing." We actually go to the Source and work directly with Nature. Nature does the work. These changes will hold until we do something in our lives to revert the energies back to their negative condition. We can also attract beneficial energies, such as leys and power spots, into our living environments. In Quest for the Blue Books: The Russell Connection to Dowsing, I tell the story of how a vision and revelation led me to the teachings of Walter Russell, who has become my mentor through his writings. Dowsing helps me understand the Russell teachings, which, in turn, help me understand what I find in my dowsing. Russell could see this world of subtle energies and understood how the universe was created. I have dowsed many homes and offices in the last couple of years and I find a definite pattern to the subtle energies in our living environments. When I find a beneficial or detrimental line of energy that doesn't dowse as an underground stream of water, I virtually always find another line of energy intersecting it nearby. If it is water, there may or may not be intersecting streams nearby. Whenever two lines of energy intersect each other, a vortex is created. This is where the energies have the strongest effect. Two detrimental lines create a detrimental vortex, and two beneficial lines create a beneficial vortex. I consider the beneficial vortexes in our living environments to be the mini power spots mentioned above. When you are in the presence of a power spot, your energy field expands and your body becomes stronger. The opposite is true of a detrimental vortex. This can be demonstrated with dowsing and with muscle testing. I have developed a simple method to find these vortexes, and believe me, they are everywhere around you. Let's begin with beneficial vortexes. I simply state my intent to find a beneficial line of energy. I then walk forward with my L-rods until they open to point in opposite directions, locating a line of energy-what I consider to be a beam of invisible light. Then I back up and approach the line at a right angle with one L-rod, stating the intent, "Show me which direction to walk to find the nearest intersecting beneficial line." Whichever way my L-rod points as I enter the line of energy, I follow in that direction with both rods, stating the intent, "Show me the nearest intersection of at least two beneficial energy lines." When I get another dowsing reaction, I know I have found a beneficial vortex, my simple definition of a power spot. I use the same procedure to find detrimental vortexes, simply substituting the word "detrimental" for "beneficial." When I find a detrimental vortex, I simply say a sincere prayer, asking that the energies change to be beneficial, and within a few seconds, the detrimental vortex turns into a beneficial power spot. As my work continued, I had many questions. What are these energies? Are they Earth Energies? Are they like bleedings of our own energy? If Nature supports us with these energies, as I believe it does, why are some of them detrimental to us? Why would Nature create anything to harm us? I believe that we have free will and we create our own reality. If this were so, why would we be at the mercy of these energies? A key to the answers came about a year ago in an unexpected way, as they usually do. I was showing a friend how to find beneficial vortexes in our home. I found a beneficial line with another one intersecting it right where my wife, Jill, was sitting. A little while later, I again noticed two beneficial lines intersecting where Jill was sitting, but she wasn't in the same chair. That got me thinking. I asked Jill to stand in the center of the room. I dowsed while walking around her in a circle, with the intent, "Show me any beneficial lines of energy that may be attached to Jill's being." I got reactions indicating two lines of beneficial energy that intersected her. She moved and the lines moved with her. She turned and they turned with her. I dowsed my friend, and he didn't seem to have these lines attached to him. I have been conducting workshops regularly for the past couple of years, teaching people my methods of dowsing and energy work. In these workshops, I began dowsing the participants for these beneficial lines and I seldom found them. At a certain point in each workshop, I always said a prayer asking for energies to come to each of the participants to bring healing and balance into their lives. I noticed in one of these workshops that after the prayer, everyone had two beneficial lines intersecting them, two beams of light attached to their bodies. Since then, I have found only a few people who always have these two lines intersecting them. I think it relates to their state of mind. Or maybe they simply pray a lot. Actually I believe that we all have these two lights, but they are generally not bright enough to cause dowsing reactions. I find, however, that whenever someone says a sincere prayer, calling for healing or something else to come into their lives, their two lights brighten enough to dowse. In fact, whenever I find these lights intersecting someone, I ask that person if he or she has said a prayer that day to bring healing or something else into their lives. Invariably they have. I believe that these are the "two lights of the soul" and that everyone has them. When we pray for energies to come into our beings or someone else prays for us, our lights brighten enough to be dowsed. We literally become a little more "en-lightened." Could it be that these two lights of the soul actually create our spiraling energy fields, just as a vortex is created when two energy leys intersect a power spot? I think so. I always find two lights intersecting people, never more and never less. They intersect at different places within each person's body, usually somewhere between the abdomen and the neck, depending on that person's healing needs or the particular prayer that was said. For example, if someone prays to bring healing to a heart condition, the lights may intersect at the heart, though that isn't necessarily the case. If someone prays for energies to come in to heal a skin cancer on his or her arm, the energies might intersect exactly at the place on the arm that needs healing. These energies can be realigned as a result of what is prayed for. I also find that the two lights are symmetrical. If one light comes in at a certain angle to one side of someone's body, I always find another one entering the other side of the body at the same angle. Sometimes I find one light running from head to toe, as though it were entering through the head and passing through the body. Whenever I find this, I know the other line will intersect at a right angle, again, usually somewhere between the abdomen and the neck, like a cross. Interestingly, on a few occasions, I have found that the two lights intersect a few inches in front of or behind the person (outside the body), indicating that the lights are actually attached to the energy field rather than the body itself. Before I continue, I want to point out that I use the term "prayer" spiritually rather than religiously. I pray to God, whatever God is, but I call on Nature to do the energy work. I feel that it is what I call the "Powers of Nature" that change the energies, following Universal Law. We have free will; Nature doesn't. Nature must support us in our efforts, whether they are for good or not. I seem to have found representations of the two lights in Christian icon images, usually of Jesus. We've all seen them. Jesus is often depicted with a circular halo around his head and with what appears to be a cross behind his head, usually shaped like the Celtic cross (left). I believe this cross to symbolize the two lights. In fact, some of the images actually depict two beams of light. The two beams of the cross depicted behind Jesus' head always intersect at the third eye-symbolizing cosmic consciousness. In the second image on the right, notice that Jesus' head is tilted, and the cross is tilted with his head. Evidently it is not the physical cross. 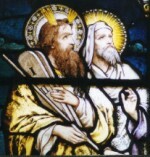 The following image is called "The Transfiguration," depicting Moses and Elijah. Notice that the beams entering Moses' head are actually depicted as beams of light. I believe that some early Christian artists knew about the two lights of the soul. I believe that the cross depicted at Jesus' head really represents these two lights. Often there are symbols on the cross. I plan to learn what these symbols mean and what current Christian beliefs are about the crosses depicted around Jesus' head. Being Jewish, I know very little about this. I suspect that the physical cross itself actually symbolizes these two lights. Most of the beneficial lines of energy that we can find in our living environments are not the major Earth energy leys that Sig often works with and writes about, though we certainly may find them there. The lines of energy commonly found in our homes and offices are more like beams of light suspended in time and space. When I explore them with dowsing, I find that they rarely extend higher than about neck height, and generally go no lower than the knee. If I dowse for the near and far edges of these beams of light, I find that they are about as thick as they are high. Again, they are like beams or shafts of light suspended in space. I find exactly the same thing when I dowse the two beams of light intersecting people. I believe that when we find beneficial or detrimental lines of energies in our living environment that do not dowse as underground streams of water, they are usually imprints of someone's two lights. (I used to think they were what are commonly called noxious rays.) When we experience a passionate emotion, we quite literally "flare up." When that happens, we imprint our two lights wherever we are or where our consciousness is directed. If we experience a negative emotion, such as anger, we imprint two negative lights, creating a detrimental vortex. If we experience intense joyful emotions, we imprint two positive, beneficial lights. These energies also seem to have a morality quality to them. If we do something that brings enjoyment to us but hurts someone else, such as stealing something from someone else, we imprint detrimental light or energy. These energies affect everyone who come into their presence, and I believe they will affect the person who brought them in no matter where he or she is on Earth. We are tied to the energies that we imprint. These vortexes expand into infinity, just as our spiraling energy fields do. I believe this to be the basis of karma, how everything we think and do is recorded energetically in what Edgar Cayce calls the "skeins of time and space," which can be read in the Akashic records, the Book of Life. It is easy to transmute the detrimental energies into beneficial energies because we created them in the first place. I believe that the Earth absorbs the negative and positive energies created by mankind and channels them along its electrical conductors, such as underground streams, energy leys, and Hartmann and Curry grid lines. When we find these energies, we can simply change them with prayer. We change them all the time with our thoughts and actions, whether we know it or not. We can also attach our two lights to objects, including food, plants, jewelry, etc. If you say a prayer, asking that a certain object be charged with the Life Force, you can then dowse two beneficial beams of light (lines of energy) intersecting the object. We can imbue any object with the energy of our intent, much like programming a crystal. As with people, when I find lights attached to objects, it is always two. Beneficial and detrimental vortexes, created by the intersections of these lines of energy in time and space, can have more than two. Once two lights (lines of energy) intersect each other, they can act as a magnet and draw more lights into them. The more intense the emotions or actions that brought them in, the more beams of light can be drawn into to intersect at the vortexes. Interestingly, our lights move with us when we move and turn with us when we turn. I find, however, that although the lights attached to objects do move with them, their alignments don't seem to change as the object is turned. They seem to keep their North/South, East/West alignments until changed by us with another prayer. Try this out for yourself. If you can get dowsing responses to energy leys or to beneficial energies (and everyone can learn to do this), you can find the two lights of the soul. Dowse while walking in a circle around a friend or family member, with the intent, "Show me any beneficial lines of energy attached to her being (assuming it's a woman)." Remember that you are looking for lines of light that intersect the person. If you don't get any dowsing responses, ask her to say a silent prayer, calling for energies to come into her being to bring healing and balance into her life. This will only take a few seconds. Then dowse again while walking in a circle around her, asking to find beneficial energies attached to her being. Do you get them now? How many dowsing reactions do you get? If you walk in a full circle around her, you divide the number of reactions by two, because you cross each beam of light or line of energy two times. You can do the same with objects. For example, take a piece of jewelry and dowse around it, asking for beneficial energies attached to it. Do you get any dowsing reactions? If so, it has been charged with the Life Force by someone. If not, say a prayer asking that this piece of jewelry be charged with the Life Force, to bring healing and balance to the wearer. Then dowse it again, walking in a circle around the jewelry, asking for beneficial lines of energy attached to it. Do you get reactions this time? If so, how many? If you do get reactions, you have attached some of your light to the jewelry, at a frequency defined by your intent. You have programmed the jewelry. Whoever wears it should test stronger by muscle testing and their dowseable energy fields should expand. Turn the piece of jewelry. Do the lights keep their original orientation or do they turn with the jewelry. I still feel that I am only scratching the surface of understanding the world of light that is behind everything in the physical universe, but I think I'm onto something important. I have much more to learn and would love to hear from you about your insights and experiences. This is a light wave universe, created by thought. We are beings of light, and we create our own reality with our thinking, every minute of every day. Keep dowsing, keep praying, keep thinking, and keep learning more about this incredible world of light that we live in. To learn more about Joey's work, visit his Tools for Empowerment website. You can reach Joey to order his book, Dowsing: A Path to Enlightenment or just to communicate with him at joey [at] dowsers.com.